Written by Jason H. Photos by Jason H. and Matt C.
The sole purpose of missions is to proclaim the glory of His name and therefore would compel His chosen people to worship Him. Missions only exist because the worship of His glorious name does not exist amongst His people. On February 9, 2018, Sunset church sent off two young men (even though I wouldn’t consider myself completely young...but I am youthful at heart!) for a 1.5week short-term mission trip to Chiang Mai, Thailand. This is the first-time Sunset church is sending any of its members to Thailand as part of its annual Short-Term Missions project. In Chiang Mai (Northern Thailand), is a gathering of various Christar missionaries during their time of retreat, rest, and worship amidst their hectic lives as missionaries throughout East Asia. The young men who were sent included Matthew Jordan Chung (Sunset church’s worship leader) and Jason Homan (me). Their task was to encourage and bless the missionaries of Christar East Asia by ministering to some of their teenage children. Matt would also provide leadership in the form of musical worship every morning to the missionaries during the start of each day in Thailand (and one session on a Friday night). If you are not familiar with Christar, as a church, we support several of its missionaries in East Asia. These humble servants include An (a former member of Sunset Church), Av, and Fe with their children (whom first request of us to send Matt and myself in the first place). While in Chiang Mai, Thailand, Matt and I were able to directly and spiritually minister to 5 teenage girls and 2 teenage/young adult boys. All these youths were missionary kids, all born in the mission fields. Many grew up with different views and cultures from our own in the States. The week includes daily devotions and discussion in the topics of Kingdom/Heaven Minded Perspective. “How do we keep a keen eye on the glory of Christ and constant worship of His name in our lives amidst living in this spiritually dark world?” That was the question that was asked on a daily basis. Overall the youths benefitted from our brief yet fruitful relationship that we developed during the week of this trip. Spiritual growths by His grace definitely bloomed amongst the youths during this trip! Praise God! God is truly gracious in providing me a ministry partner in Matthew, as he planned all our extracurricular activities for our group! 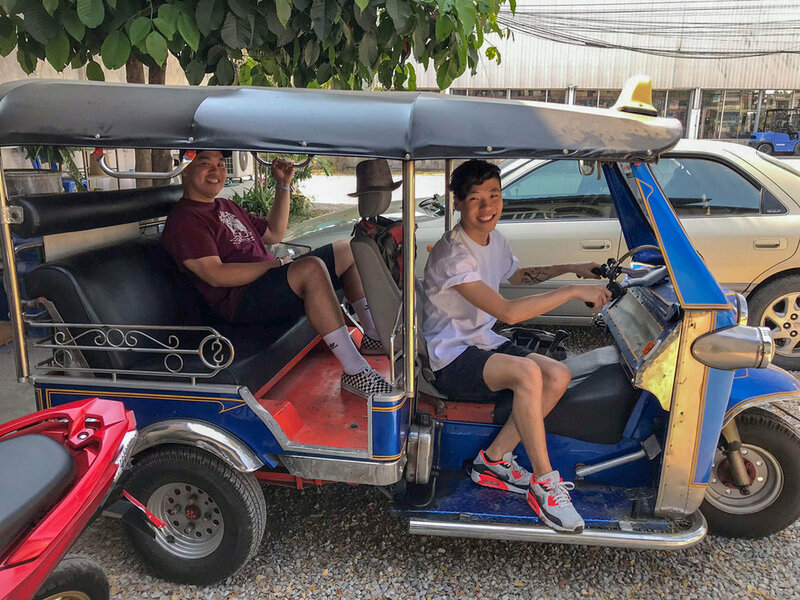 This includes riding on elephants, watching elephants play soccer and paint beautiful intricate paintings, visiting a factory that makes recyclable paper products from elephant feces, playing with baby Bengal tigers, hedgehogs, visiting night markets, and a scavenger hunt. The food in Chiang Mai was inexplicably explosive in its flavors and spice (to say the least)! God has blessed me with the spiritual gift of shepherding and teaching, but without Matt, there would not be any of the exciting fun activities that we all got to enjoy! Praise God for Matt! Perhaps the most unexpected, yet blessed part of this trip, was being able to commune, converse, worship with, and listen to the experiences of all of the attending missionaries at this conference. We truly felt the true love that all these missionaries had for our Lord and Savior! They never once considered their jobs as missionaries a sacrifice of any sort. In fact, many continued to retain the occupation/careers they had in the States. Av C, for example, once worked for Apple Inc. He continues his job as programmer and consultant in East Asia, and even starting his own company. All the while, he evangelizes and ministers to the local people he works with. The key is that missionaries, like Av C, was so in love with our Lord and Savior that he would completely surrender his family and himself as an act of worship to be used by God in every aspect of their lives in order that worship of His name be known throughout the unreached nations! Matt and I felt this passion and love for the Lamb of God, and we are so humbled and encouraged by their love and obedience. We came to bless, but in the end, we were more blessed! Because of this trip, personally I now have two more spiritual accountability partners (of whom I will continue to keep in touch with) and 7 more younger spiritual brothers/sisters in Christ, that we will keep in touch, in the teenagers that we served. God is truly there with all of us! This trip was a tremendous blessing for Matt and me, and I bring great news and blessings to Sunset Church from our missionary brothers and sisters of Christar! Church, I hope that you were encouraged and blessed by this news of what He is doing abroad and what He is about to do with Sunset Church through short term missions trip like this in the future.